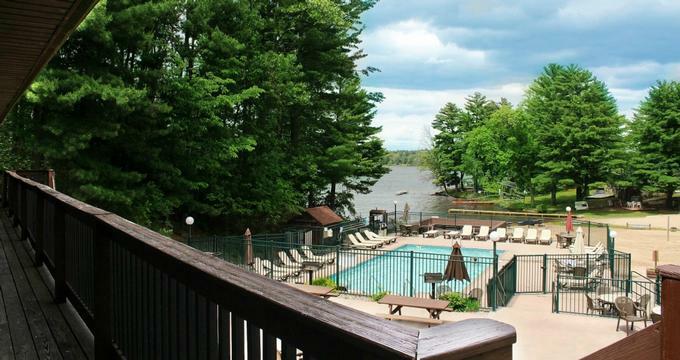 Set on the shores of Lake Delton in Wisconsin Dells and just minutes away from an array of attractions, Baker’s Sunset Bay Resort is a casual, family-operated resort with a large private sandy beach. The relaxed and inviting resort features a variety of accommodations ranging from standard hotel rooms and family-sized suites to romantic Jacuzzi suites for couples and three-bedroom/three-bathroom family-sized units. A host of amenities and facilities are available for guests to enjoy, such as two swimming pools, a hot tub and dry sauna, a children’s splash pad, a games arcade and snack bar, and a large private beach with the free use of kayaks and canoes. Baker’s Sunset Bay Resort is situated on the quiet side of the lake and within five minutes of all Wisconsin Dells attractions. Baker’s Sunset Bay Resort features a variety of accommodations ranging from standard hotel rooms and family-sized suites to romantic Jacuzzi suites for couples, and three-bedroom/three-bathroom family-sized units that sleep up to 12 people. While guest rooms and suites vary in size and layout, all are decorated in a contemporary style with modern furnishings and warm hues. Accommodations have comfortable double, queen, or king-size beds with fresh linens and hypoallergenic pillows, en-suite bathrooms with shower/bath combinations, plush towels, and branded bath products, and spacious living rooms with pull-out couches. Fully equipped kitchens have microwaves, fridges, stoves, and all the appliances and utensils needed for self-catering. Guest rooms are available in a variety of sizes and layouts, ranging from One and Two Bedroom Suites, Double Queen Mini Suites and King Mini Lakeside Suites to Two Bed and Two Bath Canyon Duplexes, Four Bedroom Family Units, Romantic Jacuzzi Suites, and Canyon Condos. Larger lodgings have spacious living and dining rooms, multiple bedrooms and bathrooms, full kitchens and private balconies or decks with beautiful views. All accommodations have fully equipped kitchens with all the necessary utensils and appliances for self-catering purposes. Baker’s Sunset Bay Resort offers an array of amenities and guest services, including two swimming pools – an indoor and an outdoor pool with water slides, a hot tub, and dry sauna, and a large private beach with the free use of kayaks and canoes. The outdoor pool has a separate, children’s activity pool and wading area and there are nightly campfires for relaxing under the stars. A new recreation building features to a children-friendly games arcade with an indoor and outdoor seating area and snack bar and a double-sided fireplace. Activities range from a volleyball court, horseshoes, ping pong, and swimming in the lake, and guests can rent boats, pontoons, jet skis and motorboats for fun on the lake. Guests staying at Baker’s Sunset Bay Resort get free tickets to Kalahari Indoor Theme Park, which has a rock climbing wall, go-karts, a ropes course, mini-golf, laser tag, and a Ferris wheel! The resort also has modern event spaces that can accommodate groups of up to 80 people for a variety of functions, ranging from reunions and baby showers to family gatherings and receptions. Surrounded by magnificent glacier-carved sandstone formations along the banks of the Wisconsin River, Wisconsin Dells is home to numerous theme parks and entertainment centers, including Mt. Olympus Water and Theme Park, and Noah's Ark Water Park, and Mt. Olympus Water and Theme Park. The Mirror Lake State Park is a forested reserve surrounding the Mirror Lake and is well known for its excellent nature trails and camping. The city and its surrounding area also have several golf courses and other fun things to do such as galleries, museums, mini-golf, horseback riding, and zip-lining.